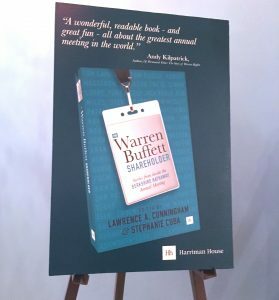 “A wonderful, readable book — and great fun — all about the greatest annual meeting in the world.” The Warren Buffett Shareholder sign standing proud ahead of the Berkshire Hathaway Annual Shareholders Meeting in May. Thanks to author Lawrence Cunningham for the picture! “The Warren Buffett Shareholder: Stories from the Berkshire Hathaway Annual Meeting,” will debut at this year’s meeting in Omaha on May 5. It’s a collection of 43 essays about the meeting and Buffett, the chairman and chief executive of Berkshire. 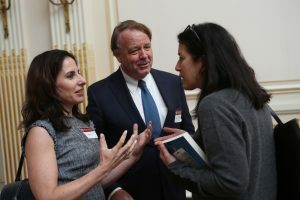 The book editors, law professor Lawrence Cunningham and his wife, real estate consultant Stephanie Cuba, and some of the other contributors will be in Omaha for the meeting and will attend book signings and other events where the book will be available. 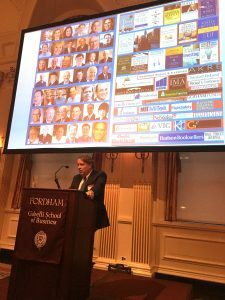 Lawrence Cunningham at the University Club in New York last night (Monday 23rd April), introducing his new book. The venue was packed, and guests were thrilled by this latest collaboration. Ahead of Buffett’s annual meeting on May 5 this year, Bogle shared a story about attending his very first Berkshire Hathaway meeting last year in an excerpt of the book, first published by the Omaha World-Herald. 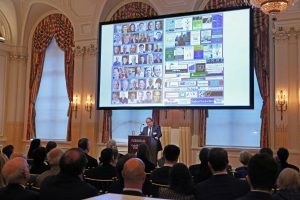 “A Berkshire shareholder’s passion and enthusiasm are unwavering, as is their positive outlook — even in a down market. They emulate Warren Buffett by behaving frugally — although that sometimes means “Spend more to save more!”. Jack C. Bogle, founder of The Vanguard Group, talks about his shoutout at the 2017 Berkshire Hathaway’s Shareholder Meeting ahead of the 2018 event. Below is an extract from Jack C. Bogle’s essay which is included in The Warren Buffet Shareholder book. Ahead of the book being published on Friday 20th April, here’s an extract from one of the essays featured in the book, written by Thomas J. Manenti. 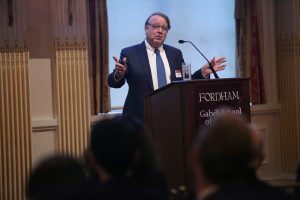 Thomas J. Manenti served as Chief Executive Officer and President of Berkshire’s Mitek industries, Inc. until January 2017. 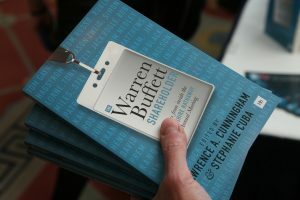 Lawrence Cunningham has engineered another book about Warren Buffett, this one a collection of essays by 43 people about Berkshire Hathaway’s shareholder meetings. Titled “The Warren Buffett Shareholder: Stories From Inside the Berkshire Hathaway Annual Meeting” (Cunningham Cuba LLC & Harriman House Ltd., 242 pages, $25), the writers include authors, Berkshire executives, professors, money managers, book sellers and others (including, ahem, me).